This week the Open Government Partnership (OGP), a group of 66 countries, is holding a global summit in Mexico City to advance a new model for 21st-century governance. The Partnership is dedicated to making governments everywhere more "open, accountable and responsive to citizens." A core part of that effort is promoting open data -- government data published online, in easy-to-use formats, that anyone can analyze, use and republish. At the summit, the OGP's leadership will invite member countries to commit to a new set of principles, the Open Data Charter, that lays out specific, comprehensive guidelines for open government data. The Charter is a watershed moment for a global movement that has been pushing governments to make more data more open in better ways. Open data is essential to government accountability: It enables citizens to scrutinize the workings of government, ask questions, and take action. But beyond that, open data on healthcare, finance, energy, agriculture, and more is fueling innovation in all sectors. Thousands of companies and NGOs around the world are now using open government data to develop new products, services, and information products. 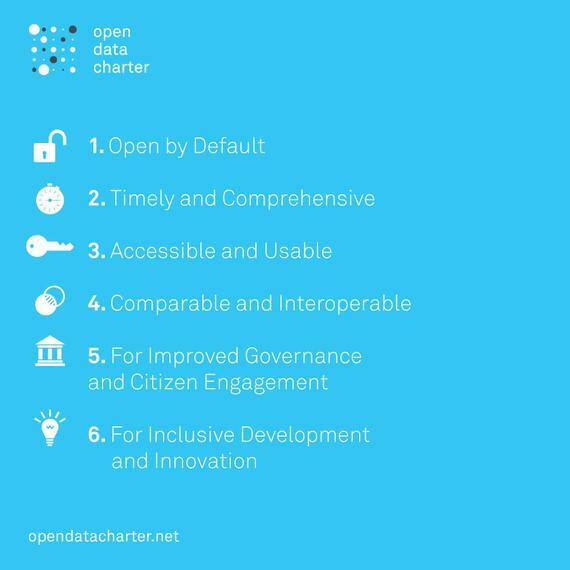 The Open Data Charter is the most comprehensive roadmap yet for making open data a major global resource. Sir Tim Berners-Lee, the inventor of the World Wide Web, has endorsed the Charter as a path to "accelerate progress by placing actionable data in the hands of people." Each of the Charter's principles describes a best practice that can dramatically increase the value and usability of open data. 1. Open by Default. Making government data "open by default," as many governments are starting to do, is a paradigm shift for how we treat government information. Under typical freedom-of-information laws, which have been enacted in more than 100 countries, citizens have the right to ask the government to give them documents and data. But to exercise this right, you have to know what you are looking for, where to find it, and how to submit a request. "Open by default" cuts through that cumbersome process by making government information automatically available to everyone, with exceptions for information that could breach privacy protections or threaten national security. 2. Timely and Comprehensive. Many governments are experimenting with new ways to make their data more timely and thus more valuable. They're supplementing their own data collections with data provided by citizens through crowdsourcing, data from mobile phone companies, and other sources. This gives them real-time data that can be used to analyze traffic and commuting patterns, track the spread of infectious disease, flag spikes in food or commodity prices, and more. 3. Accessible and Usable. Some 45 countries have launched centralized portals for their data, making it much easier to find, access, and use. The EU is building a centralized data portal for its members as well. In addition, government agencies are increasingly releasing data in machine-readable form, meaning that it can be put directly into a computer for analysis. This is a major improvement from keeping public data in paper files in government offices -- or even posting copies of those documents online, which makes them more accessible but still very hard to analyze. 4. Comparable and Interoperable. Data has a multiplier effect: Each dataset becomes much more valuable if it can be combined with others (meaning that those datasets are "interoperable"). Real estate websites, for example, need data in comparable formats to be able to put together a full picture of a neighborhood including housing prices, crime rates, school quality, access to public services, and other factors. On a more complex level, interoperability can make it possible to analyze the relationship between climate change and health trends, integrate data on federal spending from many different agencies, or analyze a host of factors that can impact national security. While interoperability is still a major challenge, there's growing agreement that international data standards -- particularly for widely used sources like geospatial data -- can open up new opportunities to combine or compare datasets for new insights. 5. For Improved Governance and Citizen Engagement. Open government data is advancing the cause of good government in many parts of the world. For example, Brazil's Transparency Portal, which launched with modest goals in 2004, now helps citizens oversee more than $12 trillion in federal spending -- everything from the funding of the World Cup to elected officials' credit card records. A growing global movement toward open contracting is now working to make government procurement open and transparent, to fight corruption and improve government efficiency. 6. For Inclusive Development and Innovation. The new Sustainable Development Goals, adopted at the U.N. General Assembly in September, set out an ambitious agenda for worldwide development and innovation over the next 15 years. The 17 Goals set targets for ending poverty, fighting hunger, achieving gender equality and improving the lives of the world population in many other profound ways. As my colleagues and I wrote recently , open data has a role to play in each of these goals and can be a powerful resource for governments working to achieve them. As governments adopt and implement the Open Data Charter, we'll begin to realize the economic and social potential of open data more widely and rapidly. The potential benefits for civil society, the private sector, and governments are huge -- and the future is truly open.